Brows are unique zones on the face. Their form and colour completely change the face. Professional service will make it more balanced and the look in the eyes more confident and open than before. Especially you can see the transformation with mature clients as the procedure wipes away 5 years of age and the face looks fresh and young. Semi-permanent make-up is a manual technique of drawing the hairs. 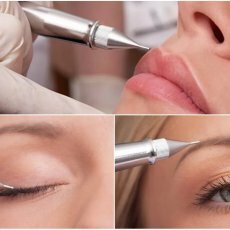 This method is exclusively manual, which means if you hear the buzzing sound during the procedure, it is not the microblading method. Pigment is inserted under the skin surface by means of the instrument which consists of the thinnest (finest) needles. The thickness of this needle is no more than 0.18 millimeters. It allows the make-up artist to create so thin lines which cannot be distinguished from the real hairs. The scheme of drawing is as close as it is possible to the direction of hair growth. 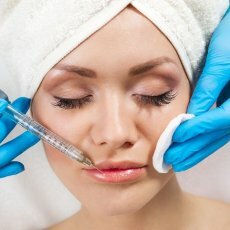 Unlike the classic permanent make-up techniques this method lacks the vibrations, which reduces the traumatizing of the skin and the time for full recovery. Moreover, the pigment does not penetrate too deeply into the skin. On one hand, because of this the result is less durable (app. From 10 to 18 months). On the other hand, it allows achieving more natural looking brows. Durability of semi-permanent make-up depends in many different factors: keeping the right skin care, age, type of skin, lifestyle, state of immune system and other personal peculiarities. Pigment lasts longer on dry and mature skin and also on the condition of slow metabolism. Darker pigment provides long-term effect. Lifestyle implies how often you visit sauna/Khammam, sunbathe or undergo the peeling treatment as all these conditions contribute to disappearance of pigment. The treatment itself takes about 2,5 hours. 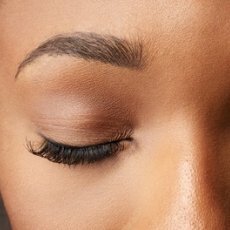 Shading or powder brows is a technique for those who aims to enhance the natural beauty. The procedure can be performed manually (microblading) as well as with the special equipment. In fact, this soft and gentle implementation of pigment in the upper layer of epidermis lacks solid filling and sharp edges. Thanks to such treatment the powder effect is achieved, but it is not as durable as other techniques (app. 12-18 months). As final finish look the brows appear to be tainted by soft brow pencil or powder, therefore they look more voluminous and gentle. However, complete solid filling lasts much longer it looks really harsh. 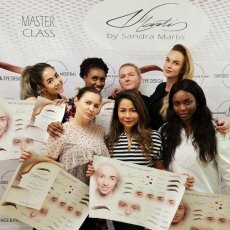 Ombre powder brows is a shading technique performed with gradient blending of colours from lighter to darker tone. 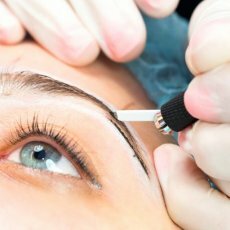 The treatment can be carried out vertically (from upper arch of the brow to the lower) as well as horizontally (slight darkening from the root to the tail of the brow). Sometimes, because of eyes/brows setting face can look frowned and upset. In these cases horizontal ombre brows is the best variant, which will help to make eyes more open. This technique also can be performed manually or by special equipment. Blended technique. Usually an experienced artist combines all the techniques mentioned above to achieve the best results. It is really common that the brow in the root is thicker on the tail, as there the hairs are almost invisible. Combining shading and microblading strokes can soften this transition and as a result natural look is achieved. Machine permanent make-up. The pigment injection is performed with the special equipment. Concerning the time, the procedure takes 2-2,5 hours. Owing to deeper penetration of pigment the finished look lasts much longer (app. 3-5 years). 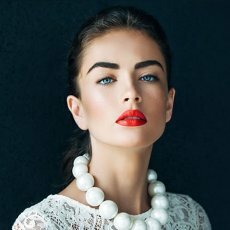 Also, as well as during the microblading treatment, the combination of strokes and powder brows techniques is possible. Are you confused? Are you lost with your choice? It is uneasy. Here we tried to give only necessary information. 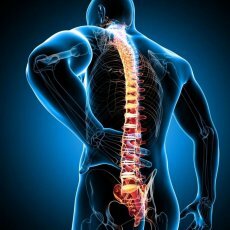 However, only certified and experienced specialist can select the techniques especially for you. That is why, while choosing the artist be ready to trust him. And don’t forget to be precise in your choice, because you will trust your face and brows to this artist who can completely change your look. Eyes are the most prominent part of your face. Dramatic and expressive look makes your face even more attractive and youthful. Beautiful eyes make every woman look younger, concealing her age. This zone is easily altered with the help of permanent tattooing. The procedure lasts approximately 2,5 hours. Usage of anesthetise gel is compulsory during the treatment. Excluding very rare exception, redness and swelling comes off during 30 minutes after the procedure or do not appear at all. In that very same day you can attend work. Eyeliner tattooing lasts longer than other types of permanent make-up (up to 7 years). This is owing to implementation of darker pigment and very thin subcutaneous tissue in the eyelids. If necessary, the correction can be held not earlier than 3-4 weeks. Eyelash enhancement means that pigment is applied strictly on the lash line. It makes eyelashes appear thicker and the look more expressive. Such type of tattooing looks very natural and is not visible to surrounding. Baby eyeliner is a very fine line which repeats natural eyelid and softly enhances the eye shape. Such a line is not easily drawn by yourself. In this case very gentle make-up is achieved and you can enjoy it 24/7. Upper permanent eyeliner not only magnifies the eyes, but also can correct their shape (for example, lowered corners), as well as conceal the asymmetry. Eyeliner wings are available in different colours from black and brown to the brightest ones in the palette. Lower permanent eyeliner is a little bit trickier. You must be really careful with it as it suits not all people. Winged eyeliner with blending is the line with blurred edges. It creates soft accent on the eyes and helps in achieving of desirable shape of an eye. It is perfect for heavy impending eyelids. This procedure is also is recommended for concealing aging flaws, when small wrinkles can deform the edges of permanent make-up. Full, juicy lips with beautiful outline have always been the sign of youth, health and sensitivity. Men constantly pay much attention to this area. There are many reasons why lips can lose their natural pigmentation, become paler and the outline is blurred (age, frequent relapses of herpes, health, etc.). The loss of volume after age of 25 years old should be considered too. Because of all these reasons face looks misbalanced and unexpressive. With the help of permanent make-up you can refill the colour of your lips, correct their shape, conceal slight asymmetry and visually boost the volume of your lips. As a bonus your lips will become even more sensual and gorgeous than before. Modern permanent make-up means soft shadow transitions and lack of sharp outlines. That is why nowadays not only the outline of lips is performed as it looks unnatural and harsh. 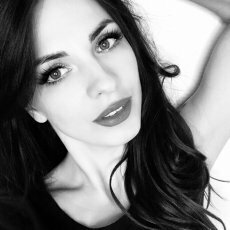 Techniques which are performed in our case are blended lip liner (when the outline is softly blended into the surface of lips) and full lip colour (infliction of pigment to all visible parts of lips). Despite the correction of shape and colour, both variants allow us to achieve visual increase in lip volume. Artist will assess is the most desirable in your case. Take in mind that lips is the most sensual zone for permanent make-up. This treatment is performed with pain reliever (special cream). The duration of treatment is about 2,5 hours. If you tend to frequent relapses of herpes, you need to take all preventive measures that are possible.